Seven weeks after having all my camera equipment stolen (see here for more details) I finally have got a replacement for the camera I lost. This is thanks to all the people who contributed financially via the internet and made it possible for me to do so. 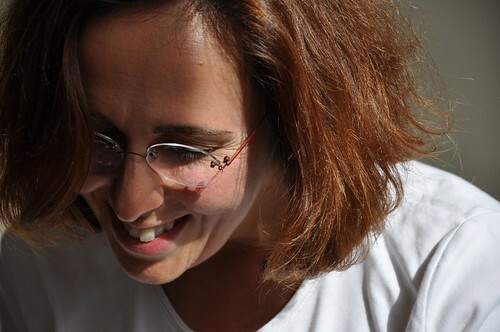 One of the good things to come out of the incident was the offers of help and support that flooded in via Twitter, Flickr and the blog, giving me hope when I was in a dark place and feeling very depressed. I would also like to thank those who made it possible for me to contine taking pictures even when I had no camera of my own. Without the help of Eleni. Asteris, Orhan and D. H. Morton the last seven weeks would have been a photograph free zone on this blog. 550 euro was donated via Tipit and the 40 euros via Paypal. Of that 33 euros (6%) was deducted by Tipit for commission and I tipped them 20 euros. Unfortunately, there were several delays in getting the money to Greece hence the fact that only recently got it. The rest I borrowed from friends. 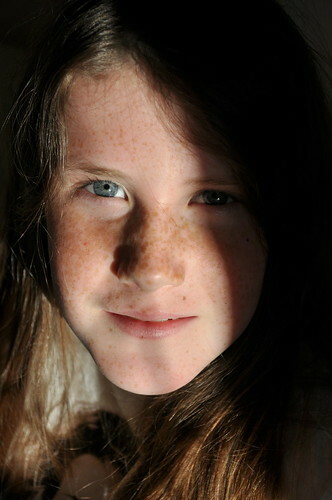 So now I'm the proud owner of a Nikon D90 DSLR with an 18-105mm lens which cost 899 euros. Also I replaced my stolen Toshiba T10 flipcam with a Traveller camcorder which cost 99 euros. So, once again thank you for all your help. 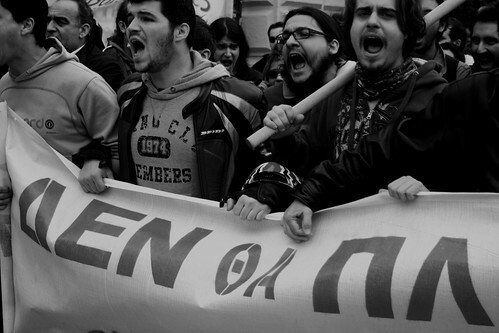 Greeks protest during independence day celebration, originally uploaded by Teacher Dude's BBQ. 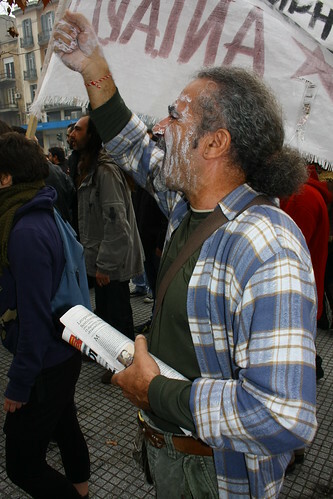 Immediately after the traditional 25th March independence parade protesters took to the streets to demonstrate against the government austerity package. Greece for sale - 60% of all Greek islands, originally uploaded by Teacher Dude's BBQ. 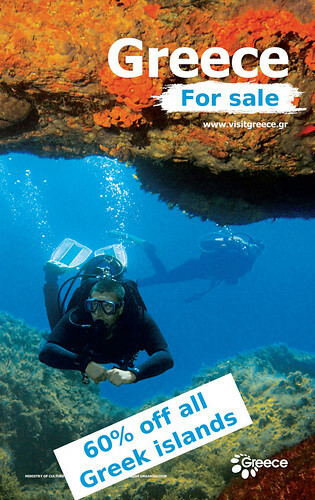 A bitter twist on the joke made in Germany about Greece selling off the islands to raise money for more loans. Like selling off wings to pay for the plane's fuel. In a flurry of emergency policy making the new PASOK government has slashed public spending and raised taxes (petrol has gone up 30% in less than two months). Yet nothing has been said about getting the Greek economy up on its feet again. You can't just cut costs if you want to save the country, there has to be some plan to get people back to work. As with any story the numbers only make so much sense by themselves and often reveal little about what is happening to ordinary people. As you probably already know Greece owes 320 billion Euros and is fighting desperately with its EU partners for the right to borrow yet more. Prime minister Giorgos Papandreou has thrown down the gauntlet to Germany, France et al to come up with a loan guarantee plan before 25th March (Greek independence day, by the way and a fact not lost on the public here) saying that otherwise Athens will go to the IMF for the money. Whatever happens one thing is certain; the country is entering a preiod of economic depression unprecedented in its post war history with a society deeply divided and a welfare system that was struggling to cope even when Greece was being compared to Ireland in terms of its growth rates. Official figures for unemployment are about 10%, a number which is no more reliable than any other wonky statistic the government cares to publish. In reality nobody knows though local newspaper state that 20% is closer to the truth. What we have is a return to the 80's and a re-run of Margaret Thatcher's first term as UK prime minister. Massive cuts in public services, clashes with trade unions and a promise to slash public debt are all part of the PASOK government's emergency program. In its wake we are already seeing a sharp rise in unemployment, and swathes of the country decimated as the ailing economy goes under. Like Thatcher, Papandreou will be aclaimed abroad for being "decisive" and "brave", for taking "difficult, but necessary decisions". All the while letting others suffer for something he and his party should have stopped whilst in opposition. Where were PASOK and the shadow cabinet when the previous New Democracy government was selling the country down river? The last time I saw the sharp end of Thatcherism was in Liverpool as a student and I still remember the damage wrought by such policies in terms of despair and hopelessness. Entire neighbourhoods wrenched apart by economists, politicians and civil servants who saw not people but graphs and pie charts. Grand theories which could be easily turned into into sound bites and question hour speeches. I am now seeing the same financial tsunami rippling through the neighbourhoods where I live and work here in Thessaloniki. Walking through one yesterday I couldn't help but notice how many small businesses had closed down over the last few months, the number of older people riffling through rubbish bins and child beggers at the traffic lights, some barely able to see over the car bonnets. On the other hand the political parties seem to think that it is business as usual and that they can continue putting on the same old puppet show to dazzle the public. However, no number of ads or sound bites can find you or your kids a job, nor replace the dreams you had for the future. The levels of frustration especially among the young have reached new heights. As 24 year old Konstantinos told me, "If there's ever a war I'm out of here. I don't know anyone who'd fight, not for this government. They don't give a damn about us". Lydia and I had a great time this weekend relaxing and catching up on each other's news. Sometimes just doing nothing is enough and I'm not a great one for structuring a child's time with a plethora of activities. I've seen enough young people run ragged by parents who think that unless their offspring are engaged in some activity 24/7 then they've failed in bringing them up correctly. As much as we want to give our children the best opportunities possible there is still a place for fun, contemplation and even laziness. 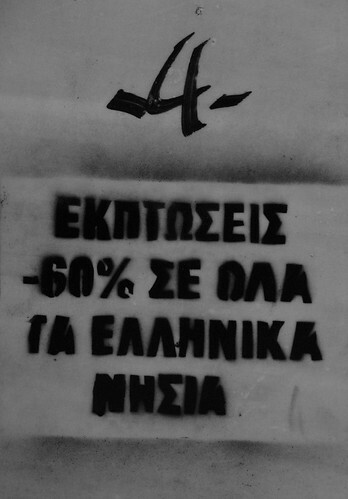 "ΕΚΠΤΩΣΕΙΣ - 60% ΣΕ ΟΛΑ ΤΑ ΕΛΛΗΝΙΚΑ ΝΗΣΙΑ: SALE - 60% off all Greek islands, originally uploaded by Teacher Dude's BBQ. Down on the Street, originally uploaded by Teacher Dude's BBQ. Just a quick post then it's off to pick up Lydia. There's plenty happening on the political front here in Thessaloniki with both New Democracy and PASOK holding party conferences here. Actually, despite what the Greek media is saying the PASOK conference is being held 100km outside the city in Halkidiki. 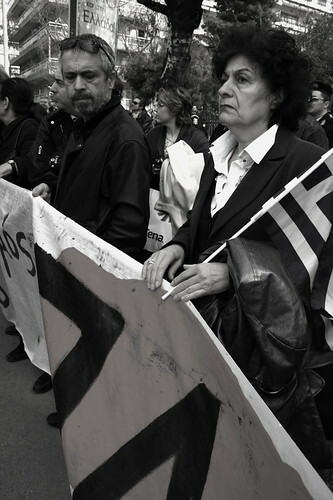 Party officials know full well that any appearance by Giorgos Papandreou in the city would provoke massive street protests. On the other hand the ND conference featuring Kostas Karamanlis is taking place in the centre but you can be sure that there will be enough officers there to police a small nation. I was thinking of going there, despite the security there are ways of taking pictures but I decided not to. 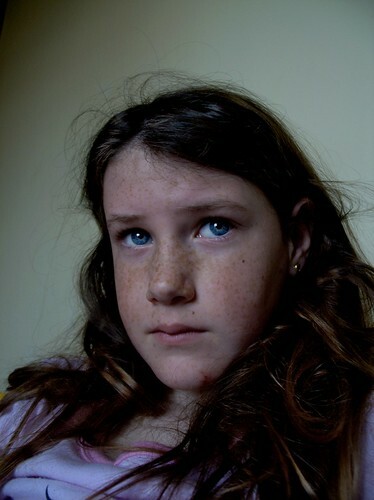 I haven't had the chance to see my daughter in some time and that is far more important than any photo and secondly, I'm sick of those in power, sick of their lies, arrogance and sense of entitlement. The same people who got the country into this mess are now exhorting people to make sacrifices. A bitter irony from those who earn more in a month than many pensioners get in a year. Greek protesters vent their anger at government's austerity measures - Taken last Thursday, originally uploaded by Teacher Dude's BBQ. Just found out that I have become an uncle to two, fine healthy nieces. My brother just let me know that both mother and daughters are doing well despite being nine weeks ahead of schedule. Wish I could have been there to share their joy. I'm not sure if I have a nose for trouble or it has a nose for me. 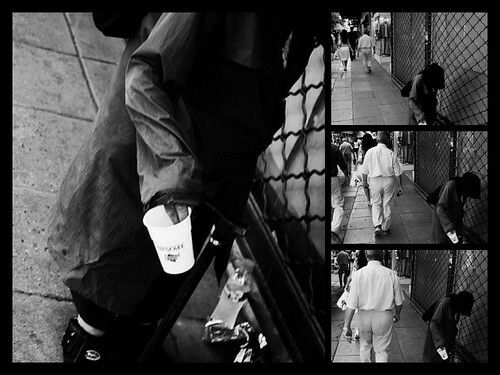 Less than 24 hours after I bought a replacement for my stolen video camera I managed to get hassled for taking pictures. This is a personal best as far as new equipment is concerned as usually, it takes weeks before that happens. On the way to work today I happened to come across a protest by ambulance crews and fire fighters outside the ex-ministry of Macedonia and Thrace. Not wishing to miss an opportunity to cover a story I parked up and decided to video what was happening and talk to those taking part to find out their demands. Just minutes after I raised my video camera an aggressive cameraman from the local ET3 (ΕΤ3) TV station came up demanding to know what I was doing there and asking f I was a journalist. Not wishing to discuss the finer points of citizen journalism versus mainstream journalism I just answered yes. At this point he started to get very angry and demanded that I showed him my "professional licence". To which I replied that he could go to hell and that I was not going to show him anything. The next thing I know he and soundman are screaming that they are going to call the cops, which they promptly did. However, it looked like the police didn't want to get involved and so I took the opportunity to duck out as the last thing I needed was to spend hours answering questions in a police station when I had to be at work. I've been repeatedly threatened by the police and often by protesters on demos but never by the media. A first time for everything. 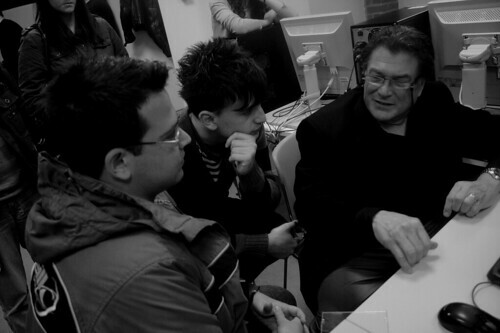 Vincent Alabiso, president of the Alexia Foundation reviewing portfolios - Thessaloniki, Greece, originally uploaded by Teacher Dude's BBQ. 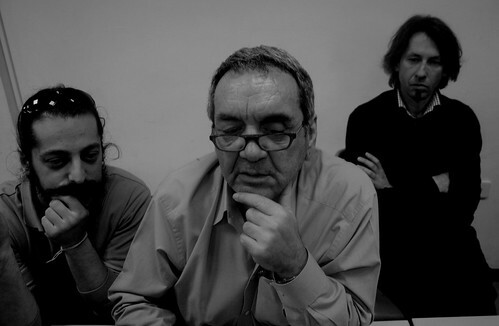 A two-day photojournalism seminar featuring speakers from the U.S., Greece was held in Thessaloniki, Greece, on March 13-14, 2010. The seminar was co-sponsored by the Alexia Foundation and the American College of Thessaloniki. 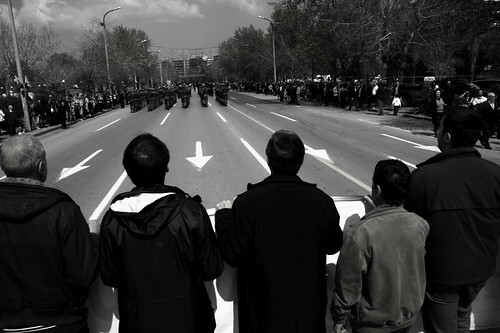 The Alexia Foundation's photojournalism exhibition "Eyes on the World" opened at the same time for a month engagement at the Macedonian Museum of Modern Art in Thessaloniki. Greek photojournalist and AP picture editor Dimitris Messinis reviewing portfolios at Alexia Foundation seminar. Where do you begin when you have so much to say that you're head seems to explode with new ideas and directions? This weekend I attended the Alexia Foundation seminar on photojournalism at ACT and it really was an eye opener. It's not often that you get the chance to listen and talk to photographers, editors and academics working in the field of photojournalism here in Thessaloniki. I'll write at more length about my impressions on the event when I have more time and can put into words the thousands of thoughts that are whirling around my head. Suffice to say it was a great way to end what has been a pretty intense week. 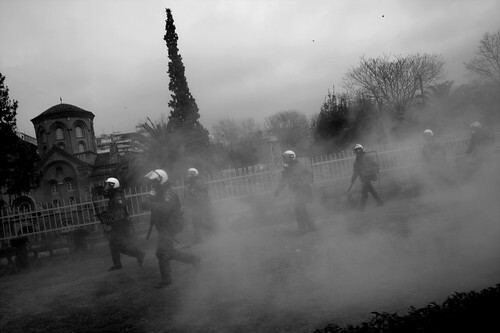 Greek riot police forced to retreat, originally uploaded by Teacher Dude's BBQ. 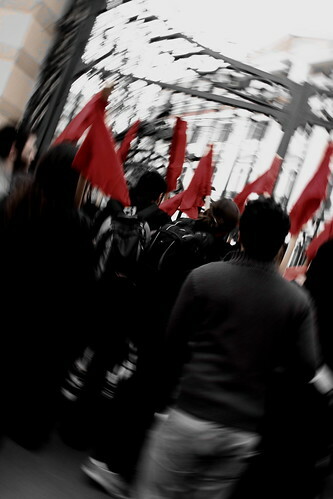 Taken during the general strike in Thessaloniki, Greece. Riot police units attempted to divide the strikers' march into two, meeting fierce resistance which forced them to withdraw. 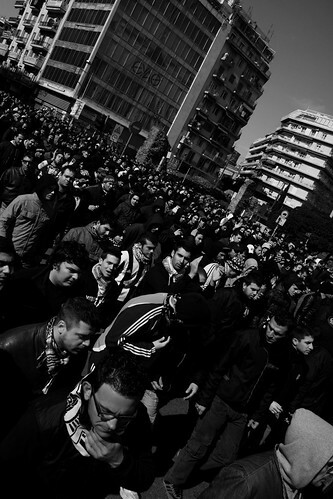 PAOK FC fans protest ban on them going to away matches- Thessaloniki, Greece, originally uploaded by Teacher Dude's BBQ. 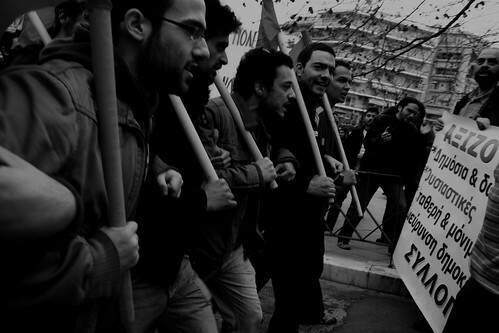 Greek general strike - Thessaloniki, originally uploaded by Teacher Dude's BBQ. 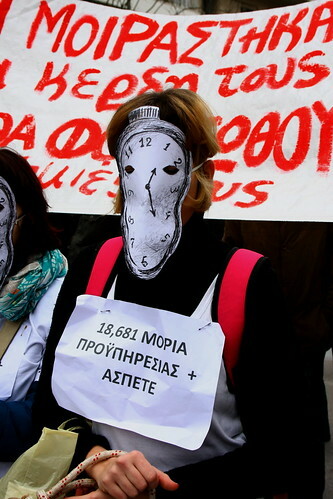 "18,681 points, experience and ASPETE (reference to her college)"
Teachers were protesting as well. Just got back from the new Saturn store opening and frankly I couldn't wait to share my thoughts. Not that it was a great experience but rather I was so annoyed that I had to get this off my chest. You'd think that with Greece in the middle of one the serious economic crises in its modern history and with skyrocketing unemployment that any new business would need to set its price policy accordingly. Nothing of the sort for our dear friends at Saturn who seems to think that the same kind of rip off prices that mark Greek retail are set to last awhile yet. Using the classic bait and switch tactic of selling a few select items at low prices while charging premium rates for everything else they are hoping to emulate sister corporation Media Markt. Today I went there with the idea of buying a Nikon D90 camera to replace my stolen D80 only to be told a price (990 euros) which is by far the most expensive price I have come across in the last month and 91 euros more expensive than in the small camera supply shops in the centre (so much for the economies of scale). When I expressed my disbelief the assistant went off to consult her supervisor and very snootily said that they could sell it for 40 euros cheaper. For some inexplicable reason this did not persuade me to part with my money. I, then did my usual check of comparing prices on things like memory cards, bags, video camera and laptops only to see that, with a few exceptions the prices were exactly the same or slightly more expensive than the other electronic retail chains - surprise, surprise. The ironic thing is that there are three ambulances parked outside with first aiders on hand to supply help in the case of a mad rush of consumers. In addition there are enough security guards to repel an invading army. Not that either was much needed as business was quiet when I was there this afternoon. Teachers' union members on strike in Greece, originally uploaded by Teacher Dude's BBQ. 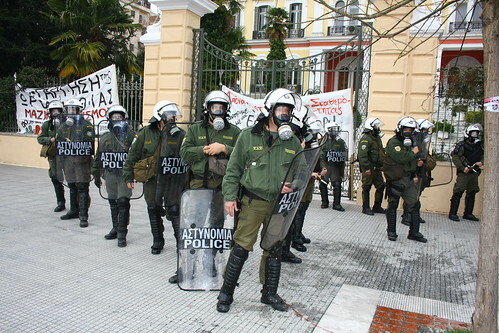 Greek general strike - riot police attempt to split protest march in two, originally uploaded by Teacher Dude's BBQ. "Greece's largest trade unions managed to bring much of the country to a halt with strikes in both the private and public sector. 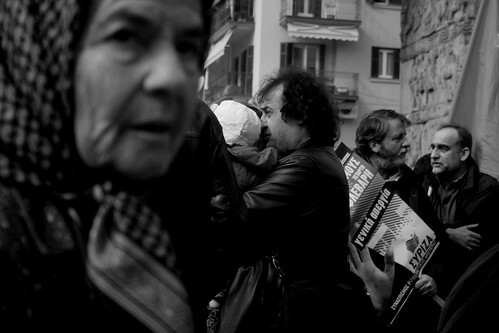 In the northern port city of Thessaloniki approximately 10,000 people took to the streets in protest against the government's recently announced austerity package. Thessaloniki, Greece. 07/03/2010. Although mainly peaceful there were some clashes when riot police units attempted to split the march in two, provoking a reaction by members of the teachers' union who attempted to block the move. 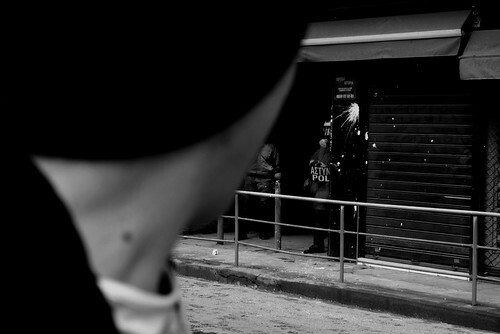 The police answered with tear gas but quickly withdrew after coming under a hail of rocks thrown by other demonstrators." Iwill be posting updates here and on Twitter as the day goes by and giving impressions of what is happening here as the general strike proceeds. So far all is quiet with the first people turning up to the rallies scheduled for this morning. The weather is grey and rainy which may have put some off. On the other hand these things never get going till at least an hour after the programmed start. All the public services are closed but the buses are still running. There are two platoons of riot police stationed outside the ex-ministry of Macedonia and Thrace and another one next to Agia Sophia church in the centre. 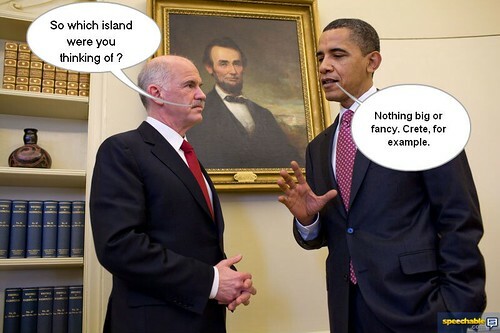 Giorgos Papandreou drives a hard bargain with Obama, originally uploaded by Teacher Dude's BBQ. After hours of tough negotiation the Greek prime minister, Giorgos Papandreou was happy to announce the full support of US president Obama for Athens's plan to combat speculators and raise new funds on the international finance markets. Papandreou said that the sale of the island of Crete was a small price to pay for ensuring the country's future and continued economic well-being. Whilst he anticipated that there would be some adverse public reaction, he was sure that Greeks would understand the need for sacrifices at this crucial juncture in the nation's history. Rumours that the German Bundersband was interested in acquiring a controlling stake in Rhodes were dismissed by Greek minister for Culture and Tourism Pavlos Geroulanos as "idle speculation." Greece set to explode over austerity package, originally uploaded by Teacher Dude's BBQ. On Wednesday the Greek government announced its long awaited package of economic measures to deal with the financial crisis the country has been facing since the discovery that the previous conservative government under prime minister Kostas Karamanlis had systematically lied about the country's debt load,. 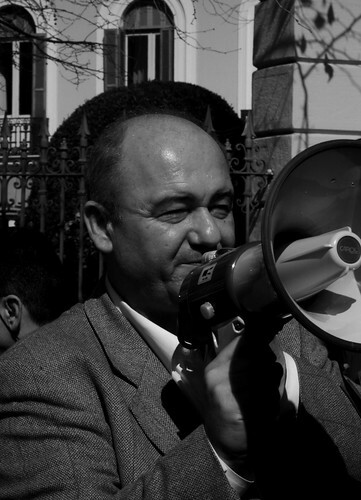 At the beginning of 2009 the Greek minister for finance, Yiannis Papathanasiou confidently predicted that Athens public lending requirements would not go above 3% of GNP, a figure that gradually creeped up over the following months. However, no one, including Greece's EU partners nor the international money markets were quite ready for the real figure of 12.3% which only came to light following the crushing defeat of New Democracy in the October general elections. On taking power Giorgos Papandreou, like president Barack Obama immediately found himself in the middle of an economic maelstrom unprecedented in recent history. Unlike America, Greece's chronically weak economy combined with a history of fiscal deception and misinformation meant that newly elected socialist PASOK party had very little room for manouevre with state coffers empty and debt repayments looming. A situation not aided by the role of speculators who saw in Greece a way of exploiting fears about the Euro and so bet on the currency losing value. 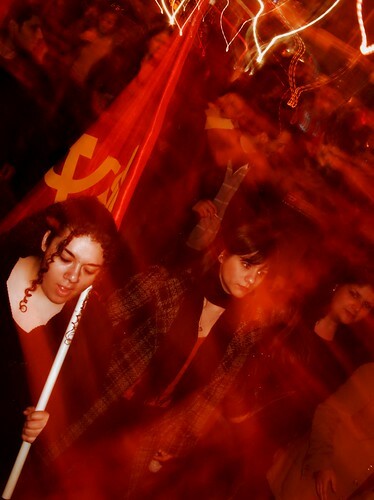 The upshot of the crisis is that a socialist government elected on a platform of social reform and aid to the poorest is currently attempting to implement a conservative fiscal reforms which are straight out the Thatcher - Friedman play book and so achieve in five weeks that which the previous right wing administration failed to do in five years in power. Already swingeing price hikes in the cost of petrol, VAT and and the promise of wage cuts across the board have produced a wave of strike actions and protests. And this is just the beginning. 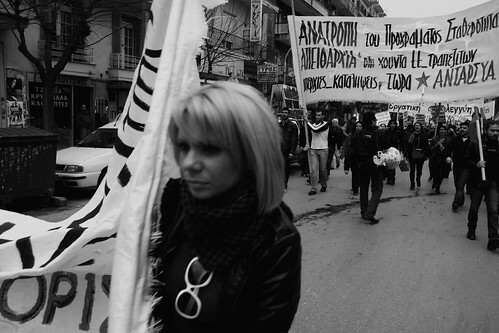 Last weeks marches were marked by violent confrontations between marchers and the riots police who, despite orders by the Minister of the Protection of the Citizen, Mihalis Chrysohoidis used tear gas to disperse those present. 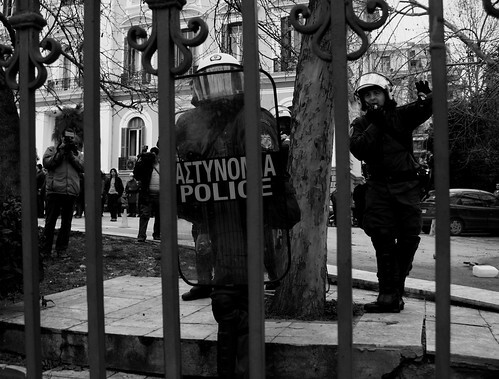 In scene reminiscent of December 2008 the heart of Athens once more resembled a war zone. 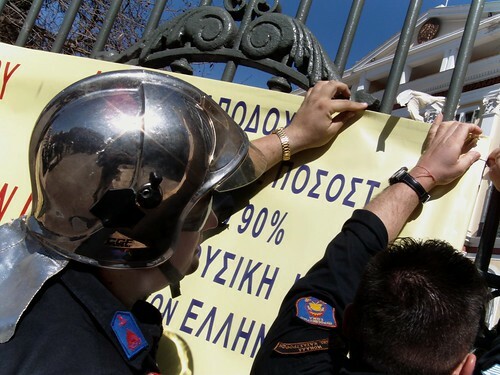 In addition trade unionists and left wing protesters attempted to storm the ex-ministry of Macedonia and Thrace in Thessaloniki, Greece's second largest city. Like the 2008's outbreak of violence the confrontation are being fueled by a deep sense of outrage and injustice and are drawing support from a wider cross section of society. Enraged pensioners are just as likely to take part in these protests as disenfrancised youths. As the austerity package starts to bite and the knock on effect of such a drastic change in the economy is reflected in skyrocketing unemployment then these clashes are set to increase in both size and intensity as more and more people take to the streets to voice their disagreement.Next week the country's trade unions have declared another general strike and with the work stoppages are planning public demonstrations which are likely to see a repeat of last Friday's violence. At the heart of the protests lies the belief that while the country is indeed corrupt and that the public service is bloated and inefficient billions of euros has been siphoned off illegally and that the man in the street is being asked to pay for the folly of the local economic and political elites who have used their power to get rich at the cost of the rest of the country. The fact that the PASOK politicians asking Greeks to make sacrifices have been repeatedly embroiled in corruption and bribery scandals has done little to convince voters to accept such painful cuts. Over the last decades members of both main parties, New Democracy and PASOK have been accused of a seemingly endless list of scandals involving corruption and influence peddling yet not one MP has ever been convicted or gone to jail. In such a climate of lawlessness where those in power seem able to float the law with impunity few have the moral stature to ask ordinary Greeks to give up so much in such a short time frame. Although untouched by scandal personally, Prime minister Giorgos Papandreou's party is currently facing allegations that the German Siemens electronics corporation paid bribes to high ranking PASOK officials in order to win contracts for the 2004 Olympic Games held in Athens. The Games which cost three times the previous ones in Sydney provide an insight into how the present economic crisis came about. Massive cost over runs, lack of transparency over contracts and a legacy of expensive facilities which lie rotting and unused across Athens are testiment to Greece's system of crony capitalism where efficiency, cost, competion, and innovation count for very little in an economy where political favours, kick backs and bribery are the rule rather than the exception. Greek protesters attempt to storm government building - Thessaloniki, originally uploaded by Teacher Dude's BBQ. 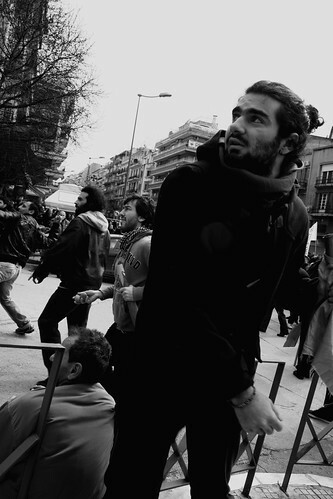 Anti-government protests - Thessaloniki, Greece, originally uploaded by Teacher Dude's BBQ. 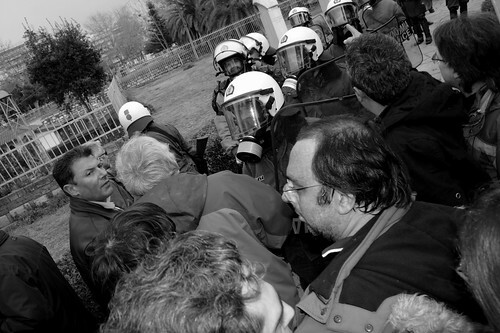 Greek protesters charge gates of ministry building - Thessaloniki, Greece, originally uploaded by Teacher Dude's BBQ. In what is shaping up to be a clash between the entire labour movement and the Greek government, thousands took to the streets today to march in the protests against prime minister's Giorgos Papandreou's new economic package which sees widespread cuts in public sector services and pay cuts for civil servants. In addition a number of raises in VAT and indirect taxes have sparked off a wave of anger and demonstrations. Thessaloniki, Greece. 05/03/2010. 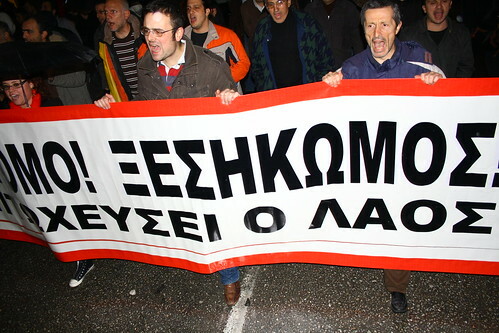 In today's marches organised by the PAME trade union confederation, demonstrators shouted “Give us back our stolen money” a reference to the widerspread belief that much of the country's 300 billion euro debt as been pocketed by mainstream politicians and those with close economic ties to Greece's two main ruling parties, New Democracy and PASOK which have governed since 1974. Riot police used tear gas and pepper spray when protesters belonging to a coalition of left wing parties and groups attempted to bring down the main gate at the entrance to the ex – ministry of Macedonia and Thrace in the northern port city of Thessaloniki. About a dozen of the demonstrators managed to enter the ground of the government building to stage a symbolic occupation. 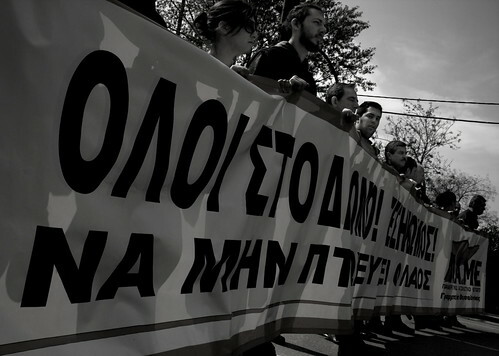 Greek trade unions fire opening salvo over austerity measures, originally uploaded by Teacher Dude's BBQ. The cuts in salaries combined with a rises in VAT of between 1 and 2% have angered many Greeks who believe the $420 billion debt has gone to line the pockets of the rich and that it is they who should shoulder the burden of reducing the deficit. 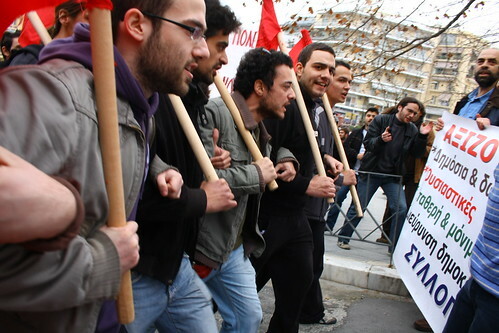 Marching under the banner, “The plutocracy should pay” the communist controlled PAMe trade union confederation marched this today in Athens and Thessaloniki. Other actions also included an occupation of the economics ministry and the state run ET3 TV station. On the internet Greek Twitter users could barely contain their outrage over the new economic measures which aim to fill government coffers and cut down on the bloated government budget. However there was anger over the fact that areas such as defence spending which soaks up 4.3% of GNP, a figure twice that of the UK was untouched wheras the education budget was cut by 600 million euros. Tomorrow sees the first in a series of widespread strike actions across Greece which threaten to bring the country to a standstill.